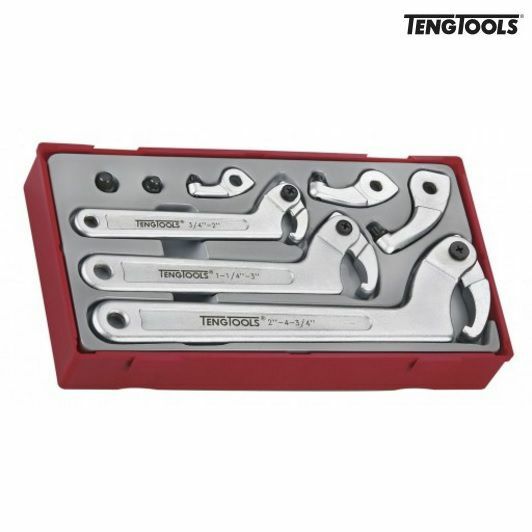 TTHP08 Hook and Pin Wrench set TC-Tray 8pcs | DamenCNC B.V.
TENG TOOLS Hook and Pin Wrench set TC-tray 8PCS consisting of 3 combined pin/hook spanners with 3 pin adaptors and 2 spare pins in diameters 6 and 8 mm. Supplied in a plastic TC tray with removable cover. Fits in Teng Tools tool boxes and tool trolleys. Supplied in a plastic TC tray with removable cover.